based Land Surveying business office from 239 Main Street North. Council's Regular Meetings are held on the 2nd and last Wednesday of each month at 7:30 pm. Deadline for correspondence for the agenda is 12 noon on Tuesday, day prior to the meeting. The Town of Glovertown is seeking expressions of interest for the purchase of property lot #'s 51 & 52 to be sold as one residential building lot (one house only) at the corner of Future Street and Campbell Place. Minimum price to be considered is $20,000.00 plus HST. Written expressions of interest must be sealed and submitted to the Council office on or before Monday March 25, 2019.
in on March 7, 2019.
based Adventure Tourism Tours business office from 13 Crewe’s Road. Items are used, in good condition. Sold together as one package - not separately. Items can be viewed at the town office during regular business hours. Minimum bid has been set at $100. PLEASE BE ADVISED THAT THE C.C.G.S GEORGE R. PEARKES WILL BE CONDUCTING HARBOUR BREAKOUT IN GLOVERTOWN AREA AM FEBRUARY 06 2019. THE ICEBREAKER WILL BE LEAVING AN OPEN WATER TRACK IN THE ICE. based Medical Foot Care business from 108 Station Road. All garbage throughout town will be picked up on Friday December 28th. Please put your garbage to the curb the night before or early Friday morning as the truck will be in Town earlier than usual. If your garbage is normally picked up on Tuesdays, it will be picked up on Wednesday January 2, 2019.
turkeys from 53 Bayview Heights. Council has received an application from Walter Corey Denty to operate a home based Dog Kenneling business from 20-22 Riverside Road West. Any persons who feel they would be adversely affected should this application be approved, must express their concerns in writing, to Council on or before 3:00 pm, Tuesday November 20, 2018. Council Meeting will be scheduled for Tuesday, October 30th, 2018 7:30pm instead of the regular Wednesday meeting on October 31th, 2018 due to Halloween. Please visit the Town of Glovertown's Website to see the regulations. At the center of it all, Glovertown’s Town Center welcomes you to gather, relax, make new memories and enjoy the moment. Please join us to celebrate this joyous occasion. Refreshments will be served during the event at The Glovertown Visitor Information Center. On Wednesday, September 5th garbage will be picked up in the afternoon on Main Street North due to the Labour Day Holiday. Due to the extremely dry conditions, the Glovertown Town Council has issued a FIRE BAN. We also ask that all cigarettes be extinguished and disposed of cautiously. Due to the paving of Aspen Valley Lane on Wedesday, August 29th, access to the South Shore boat launch is not avaiable. Gander Beacon Thursday June 14, 2018 edition. The Town of Glovertown is accepting applications for a position at the Visitor Information Center. We are seeking a mature, dynamic and well-organized person who enjoys conversing with the public. keeping up to date with local accommodations, places to visit, activities and events. Please be advise that the next Council meeting has been change from February 14th to February 13th. The Town will be holding a public auction on Wednesday January 17th at 1:30 at the Town Hall for properties at 9 Station Road and 30 Station Road for sale of tax arrears. Please contact Pam Thornhill at 533-2351 for further information. If your garbage is normally picked up on Tuesdays, it will be picked up on Wednesday December 27th. If your garbage is picked up on Wednesday, December 27th, for the Christmas week it will remain the same. Please put your garbage to the curb the night before or early Wednesday morning as the truck will be in Town earlier than usual. Schedule will remain the same. based -Hair salon business at 1-3 Blueberry Place. Professional Animal Grooming business at 13 Blueberry Place. as of October 5, 2017. Comsumers are advised to bring water to a rigorous rolling boil for five minutes. There will be a flyer in tomorrows mail with further information. October 4th there will be No Water or Low Water pressure from Hillview Heights(Bank Road) to end of Main Street South from approximately 9am to 12pm. For Councillors: We have 11 candidates running for 6 seats. Good Luck to all candidates and we hope to see every eligible voter out on Election Day. September 26th. Nominations for Council will be recieved August 31st, 2017 at the Town Hall from 8am to 8pm. Please contact the Town Hall for further details at 533-2351. Check out these activities for July 1st celebrate at the Marine Centre in Terra Nova National Park at 1:00 Pm for the wreath laying and then 1:30 Pm for the Canada Day Carnival and at 2:30 pm for the cake cutting. Then at 7 pm join us at the Marina in Glovertown for music, barbecue and fireworks. A Jam Packed Canada Day right here in this area! We are looking for new membership. The deadline for interest will be Friday, March 31, 2017. FROM 10 AM TO 2 PM AT THE RECREATION GROUNDS (BEHIND THE ARENA). FOR FURTHER DETAILS THERE WILL BE A FLYER IN YOUR MAIL EARLY NEXT WEEK. WILL BE CONDUCTING A HARBOUR BREAKOUT OF THE GLOVERTOWN SHIPYARD COMMENCING BETWEEN MARCH 25 AND MARCH 29. THE ICEBREAKER WILL BE LEAVING AN OPEN WATER TRACK IN THE ICE. THE TOWN COUNCIL HAS BEEN CONTACTED BY THE SCHOOL ASKING US TO ADVISE LOCAL ORGANIZATIONS AND BUSINESSES THAT THERE ARE SOME STUDENTS IN GRADE 9-12 STILL WORKING AT EARNING THEIR VOLUNTEER HOURS FOR A COURSE THAT THEY HAVE TO COMPLETE. IF YOU ARE NEEDING VOLUNTEER SERVICES PLEASE CONTACT SHAWN ROWE AT 533-3333 FOR FURTHER INFORMATION. It will now be picked up on Monday November 9, 2015. Council has received a proposal from Drexel Sparkes to develop a 12 site RV Park at 245 Station Road (between East-Glo Electric warehouse and Glovertown self storage units). Any persons who feel they would be adverely affected should this proposal be approved, must express their concerns in writing, to Council on or before 3:00 pm, Tuesday, September 29, 2015. Water will be off Thursday June 18, 2015 9 am for approximately 6-10 hours to connect a new water service. Area of town affected will be from Oram's Funeral HOme to end of Main Street South including all by roads. THE GLOVERTOWN FIRE & RESCUE WILL BE HAVING TOLL BOOTHS AT THE GLOVERTOWN CLINIC AND FIRE HALL FOR "FILL THE BOOTS" FOR MUSCULAR DYSTROPHY ON JUNE 13TH FROM 10:00 AM TO 2:00 PM. Council has received an application from East-Glo Castle Building Supplies to construct 5 affordable housing units on the north side of Angle Brook Road just beyond the property of Kevin Holloway. Council has received a request from Edwart Stewart to establish a domestic sawmill at 19 Riverside Road East. Council has received a request from Keith Feltham to relocate domestic sawmill to 5 Hawkins Road. Sorting Waste is as easy as 1,2, 3! Residents and businesses in Central Newfoundland can now sort waste and do more to protect the environment. There will be a Public Meeting on Wednesday December 17, 2014 at 7:30 pm at the Lions Club to discuss the feasibility study considering the Amalgamation of the Town of Glovertown and Traytown. The 8th Annual Diamond Dash Cross-Country Race will be held on Saturday, September 27, 2014 at Ken Diamond Memorial Park. The organizing committee are proud to announce details for this year's event. Further information can be viewed by clicking here. 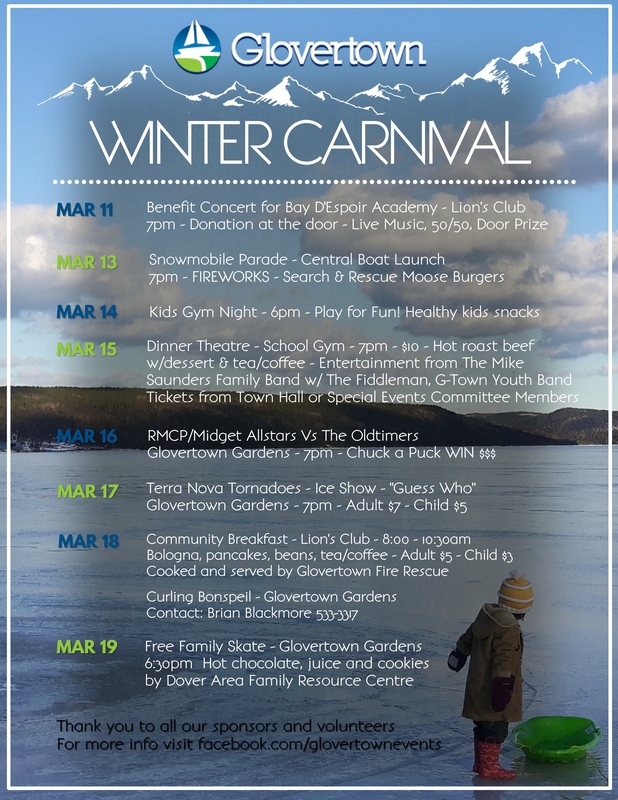 Further information can be obtained by contacting the Town Office @ 533-2351 or by e-mail, glovertowncounc@eastlink.ca. Please click here to view the Town of Glovertown community newletter for April 2014. 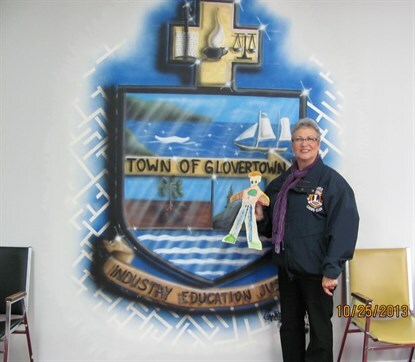 To view the Town of Glovertown Newsletter Archive, please click here. The Town of Glovertown has released its tax rates for the year 2014. You can view all our tax rates by clicking this link.